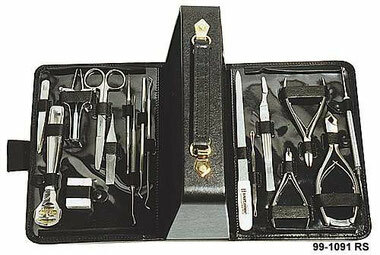 Cosmetic schools and institutes, beauticians and pedicurists and the well-known specialized wholesalers today require cutting tools and instruments made of stainless steel. Particularly in view of the hygienic regulations. MALTESER - profinox instruments are perfectly qualified to this task and meet all quality standards. The tools are available in stainless steel, polished surface or in satin finish, also with additional gilding. Nail-nippers for heavy duty cutting, nail-corner forceps with fine points, cuticle-nippers with extra fine and diverse edges, scissors, tweezers and instruments for all professional requirements are produced and tested with extreme care and precision by experts. That is why MALTESER products cut and grip precisely and safe, making the work with these instruments a real pleasure. Along with this, MALTESER delivers the corresponding care-sets and instrument-cases, complete or without contents. The cases are made of genuine leather and are easy to clean on the inside. Some models have compartments for aids, i.e. spare blades, cleaning material and cotton. For advice and information can be requested via CONTACT.